The ADO Stored Procedure action enables you to automate the execution of stored procedures using ADO. The action property pages helps you build your connection string, displays a list of stored procedures in the target database, and will retrieve the parameters for the selected stored procedure. The value of each input parameter can be set, and the out values and return values can be saved to a variable. It is important to set "Stored Procedure Returns Recordset" correctly, as this controls how the action internally calls the stored procedure. 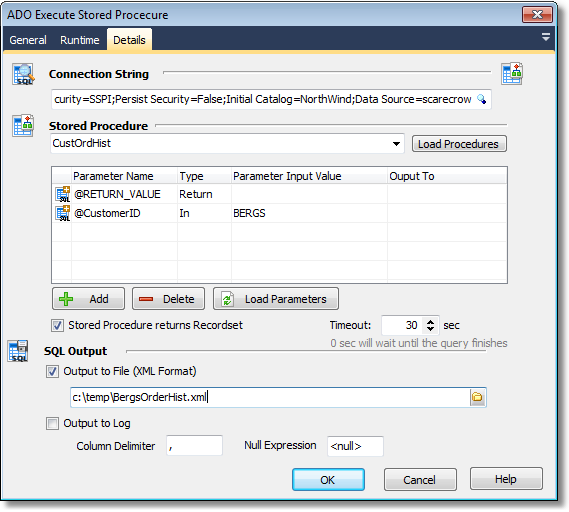 Stored Procedure - once the connection string has been specified, you can click the "Refresh" button and a list of available stored procedures will be listed. Once you select a stored procedure, the parameters will be listed. If the stored procedure is yet to be defined then you can manually enter the stored procedure name. Parameters - The Name and Type of the parameters should retrieved automatically, if not then you need set them to the correct values. For any IN or INOUT parameters you should set a value (either a hardcoded value, or use an FB Variable). For any Return, OUT, or INOUT parameters you can optionally set an FB Variable for the value to be saved to when the stored procedure executes. Use the Add and Delete buttons to manually define the parameters if the stored procedure is yet to be defined. Stored Procedure returns Recordset - It is very important that you set the "Stored Procedure returns Recordset" option correctly, as this determines how the stored procedure is called internally. SQL Output - You can output a result recordset to the FB log, and/or to and XML file using the ADO XML file format.